Superlative Time grew out of a relationship between a team of experienced watch repairers' and a fraternity of collectors who wished to trade some of their watches. 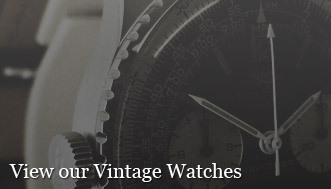 Over the years we have helped owners sell and trade with other collectors in the community, we have sourced rare vintage watches for them, we have advised on potential purchases and naturally we have repaired and maintained their watches. With us they have the confidence that if we offer a watch it meets our high standards and won’t have any hidden surprises. While we deal with modern pre-owned watches like Rolex, Audemars Piguet, Hublot, IWC and Tag Heuer, our passion lies in vintage watches and we specialise in companies like Patek Philippe, Jaeger LeCoultre, Rolex, Breitling, Heuer and Omega from the 1920’s to the present day. With over 35 years’ experience, Graham Simmonds is the senior watch repairer and every watch that we offer has been serviced in our own workshops and comes with a two year guarantee. Graham, an accredited Rolex repairer, served his apprenticeship at Garrard and Co in the 70's and went on to work for Omega and Breitling before setting up his own workshop looking after the pieces of many of the biggest vintage dealers in the UK. For modern watches, post 1980, we are able to service most models and movements using original factory supplied parts, including waterproofing and depth testing where possible. Over the years we have focused and specialised our knowledge in quality watches form the golden ages of the Fifties and Sixties, both manual wind and automatic, civilian and military. In particular we are able to restore and service most complicated vintage movements including the legendary chronograph calibres from Valjoux, Venus, Lemania, Longines and others. We have a specialised knowledge of such vintage watches as the Rolex Daytonas with the Valjoux 72, the Omega Speedmasters powered by both the Calibre 321 and 861 and one of our favourites, the early Breitling 806 Navitimers with the Venus 178. At Superlative Time we understand that whether you are buying a single watch as a gift or you're building a collection, it’s important that you entrust your watches to people you have total confidence in and who can maintain and restore your pieces so they can be enjoyed for many generations to come.